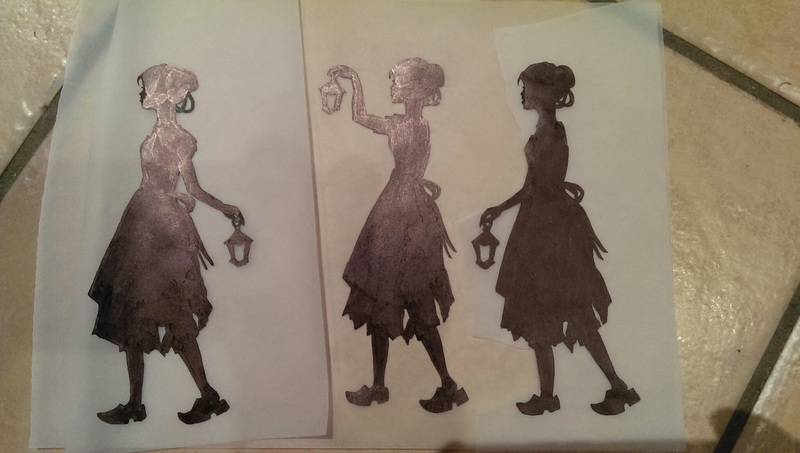 So I thought I had all my images sized and ready when I get some feedback from the non artists in the house, about the Cinderella/Aschenputtel character. "Why does she have a brush?" I'm asked. I try to explain how she needs something to denote who she is, since my previous suggestion and drawings of pumpkins were pronounced "twee". Considering her silhouette is in front of trees I conceded a brush was a bit useless. I thought and suggested a lamp, which we all agreed was atmospheric and suggested twilight or evening. The thing with silhouettes is, you have to get the clues in without over complicating or making them look odd. With her holding the lamp, I needed a position where her arm would not obscure other details that I wanted or look as though she has an arm grafted from her stomach (even though it was anatomically right) and look very strange. It can be a curious balacing act. So I spent another few hours working on these.